(from page 16 of the 1966 Collection) Candyapple Red 1966 Mustang hardtop with the base 120hp (at 4400rpm), 200ci, 1 barrel, 6-cylinder engine. 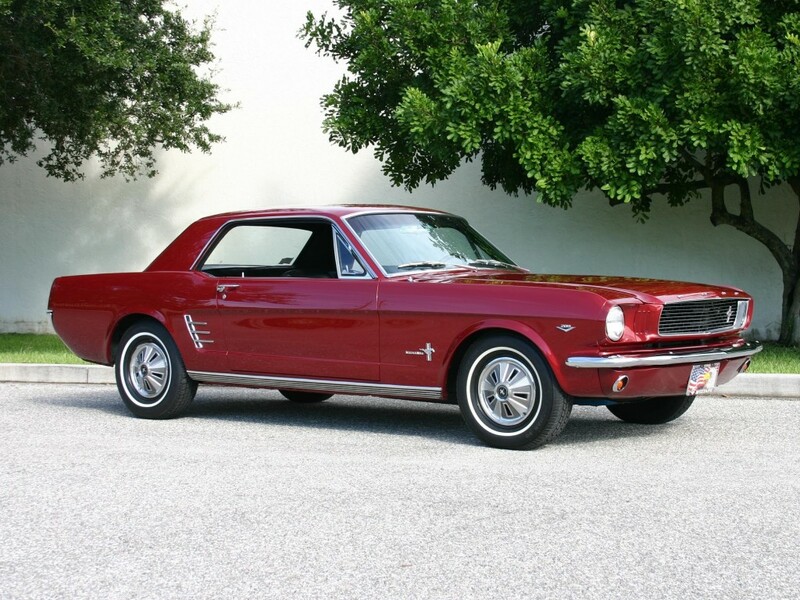 (from page 22 of the 1966 Collection) Check out this Candy Apple Red 1966 Mustang hardtop. It's owned by Brian Green from Salt Lake City, Utah. This is our featured Attitude Of The Week for the week starting December 2, 2012. It has the 200ci six cylinder engine (original) with an automatic transmission. Brian bought it for $500. It had a rough interior that was in three shades of white, gray and black. It had no wheel covers. Brian restored this Mustang himself. (from page 22 of the 1966 Collection) The grille on a 1966 mustang has the emblem floating in the middle. One year earler (the 1965) and one year after (the 1967) have bars holding the emblem. 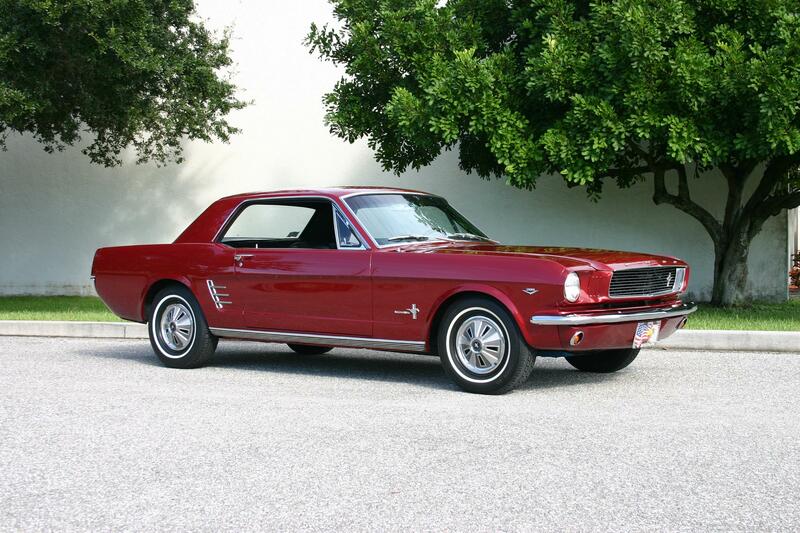 (from page 24 of the 1966 Collection) Candy Apple Red 1966 Mustang hardtop owned by Rob Betea from Michigan. Rob tells us about his Mustang, "Dual exhaust, TMI sport console, electronic ignition, American racing tork thrus II rims 14x6 (soon to be magnum 500 14x6 front, 14x7 rear), retro sound radio Zuma, Rally PAC, and fiberglass hood with 67 twin scoops. Had her for one year so far. She is a driver. Had one just like it in 1968, till someone brought their car through my passenger side. I sat on the curb and cried. I have had several more 65 and 66s through the years but nothing like this. I bought it turn key, but had to add on to make it mine. I am 64 years old and feel like a kid when we out in it. Lots of fun, and looks! This car makes us happy." (from page 24 of the 1966 Collection) It has a 289ci V8 and a manual transmission. It has a GT style rear valance. (from page 30 of the 1966 Collection) Candy Apple Red 1966 Mustang hardtop with full wheel covers, metal rocker panel trim, and a modified grille with an offset tri-bar pony emblem. This photo is available in two wallpaper sizes; 1024-768 wallpaper and 2400-1600 wallpaper. (from page 33 of the 1966 Collection) This custom 1966 Mustang hardtop racer is owned by Brad Cross. He says, "This has a modified 289, 4 speed. Competition suspension and brakes. Set up to meet SCCA vintage safety standards. I have ran this car since 1993, shifts at 8,400 rpm under track conditions and have never had any issues with this hard charging solid roller power plant, minus some wiring and many carb changes. Using the R model front end to move air where needed with a cowl hood to achieve max efficiency. Interior is a stock look, minus roll bar, belts and radio delete. I still utilize the factory shifter. I do drive short runs on the road but between the kidney killer suspension and 4 to 6 miles a gallon, it's a little tough but I FREAKING LOVE IT."